Carroll, Noel, "Entr'acte, Paris and Dada," pp. 5-11. Caws, Mary Ann, "For a Cinema of the Central Eye," pp. 25-37. Hagan, John, "Cinema and the Romantic Tradition," pp. 38-51. Liebman, Stuart, "Jean Vigo's A Propos de Nice: A Surrealist City Symphony," pp. 12-20. Liebman, Stuart and David Shapiro, "Surrealism and Cinema: A Conversation with Annette Michelson," pp. 52-59. Sanderson, Alister, "The Diary Cinema of Howard Guttenplan," pp. 107-20. Shapiro, David, "An Interview with Ken Jacobs," pp. 121-28. 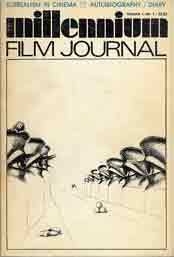 Sitney, P. Adams, "Autobiography in Avant-Garde Film," pp. 60-105. Vigo, Jean, "Toward a Social Cinema," trans. Stuart Liebman, pp. 21-24. We found a few print copies. They are in excellent condition -- a little faded after 34 years -- and we are making them available for $59.00 each while supplies last. AT THIS POINT ALL PRINT COPIES HAVE BEEN RESERVED. IF ANY BECOME AVAILABLE WE WILL RE-OPEN THE SALE. We also scanned one copy. You can purchase a pdf of the scan for only $5.00. Make your choice in the pull-down menu below, but please be sure to type your email address if you select the digital version.